A very special experience awaits you. 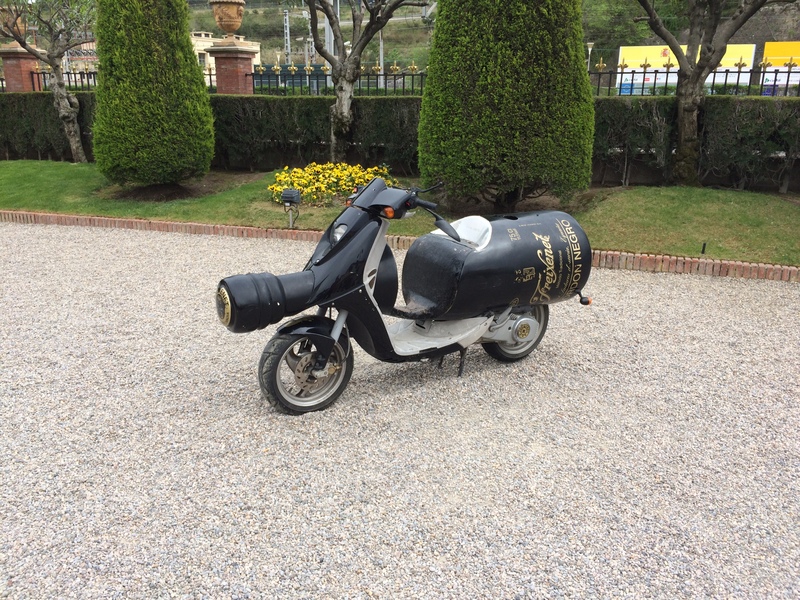 If you are a wine lover and are eager to experience some of the greatest wine regions in the world, we have a journey for you. Seven nights in France, with time on the left and right banks of the Gironde River to explore the tastes of Bordeaux wines, followed by time in Paris, the City of Light, and a day in the Champagne Region to savor the famous wines of that historic area. This intimate, small group tour features lodging in fine hotels, meals in châteaus, visits to the legendary vineyards, and tastings of some of the great wines of the world. In Paris, we will pair wine and food at specially selected restaurants, have a literary walking tour with a local author, and even have some free time to explore on your own or just relax and sit in a sidewalk cafè. 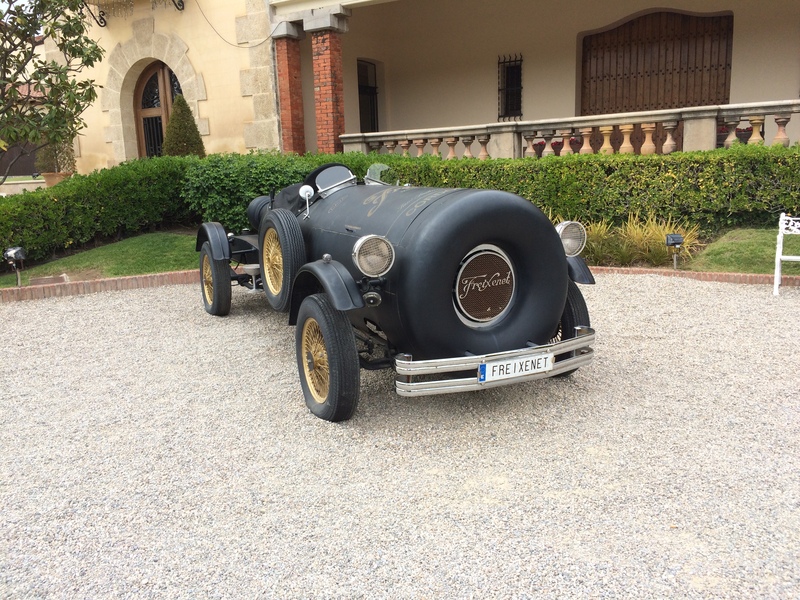 All the while, you will learn more about wine in the vineyard and at the château. All tours will be in English, but there will be interactions with French people. Led by American wine blogger Jim Lockard (JimLockardOnWine.com), who has traveled extensively in France and who will be joined by local experts, you will get the inside story of some of the great wines of Bordeaux and Champagne and have access to places not generally available to the traveling public. This small group experience will give you the opportunity to interact with the guides and the winemakers and sommeliers. 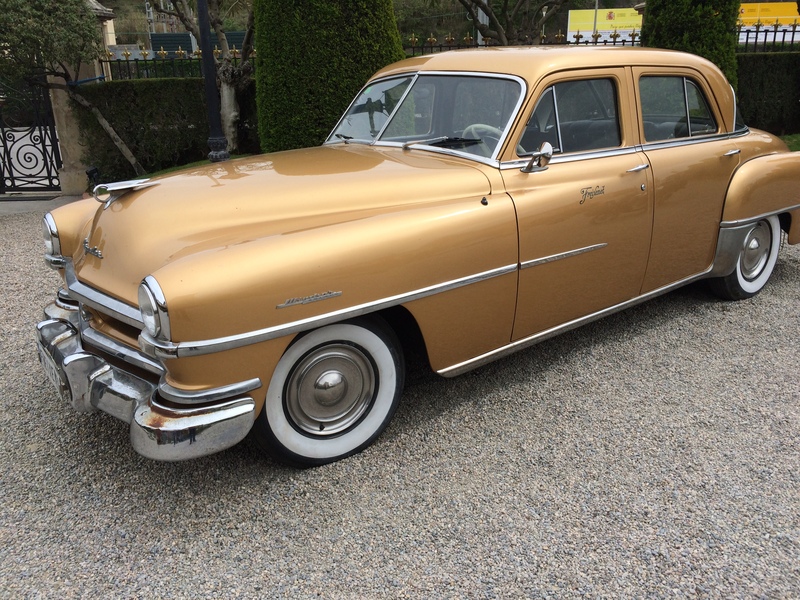 You will be joined by a few other wine lovers and share gourmet meals and luxury transportation. 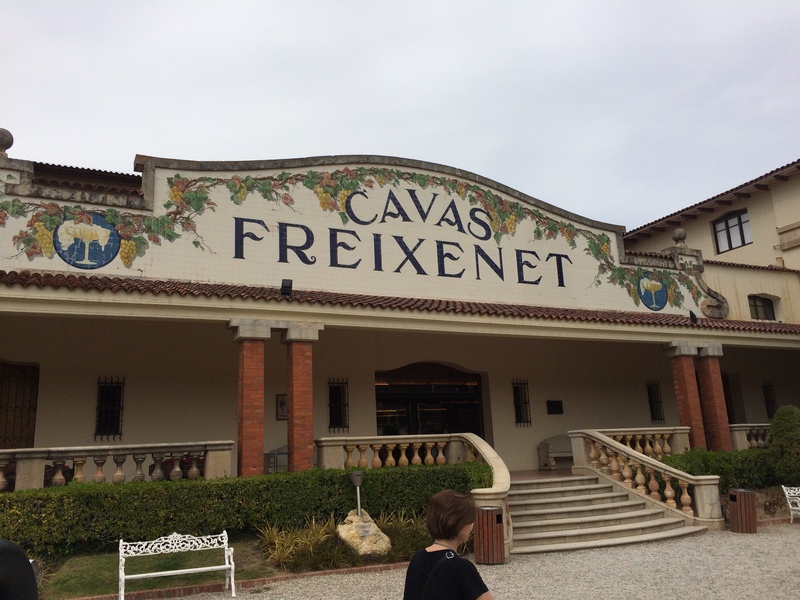 Now you have the opportunity to join them for the wine experience of a lifetime. Every now and then, something really creative is invented in the wine world, despite its ancient origins and long traditions. 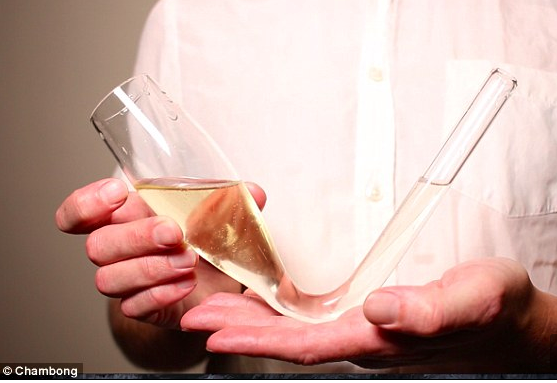 So, with tongue firmly planted in cheek, I present to you the latest such invention: THE CHAMBONG! The bong for Champagne. From Drinks Business publication: “The drinking vessel, which fits up to 4 fluid ounces (120ml) of liquid, is available online at a price of $25. It is made of borosilicate glass and is dishwasher safe. 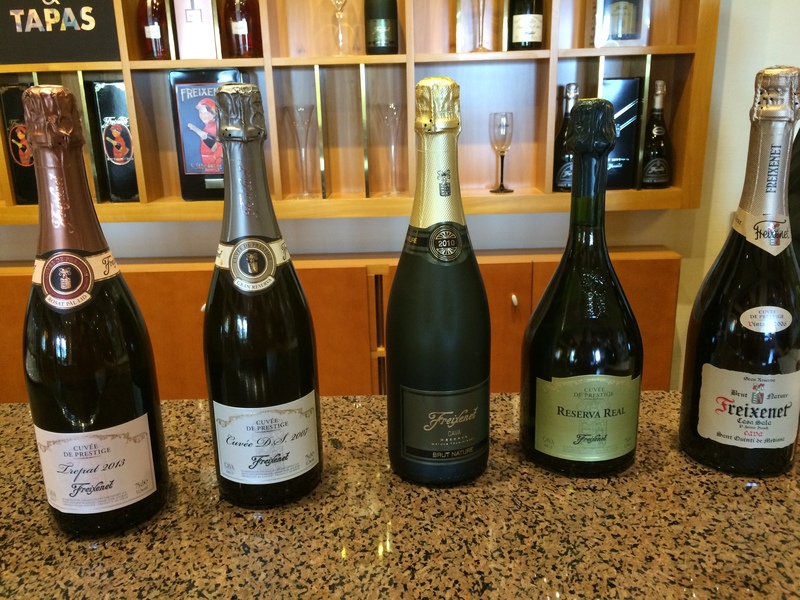 There was no comment from anyone in the Champagne industry. This article from National Geographic Intelligent Traveler (LINK TO ARTICLE) shows how Bordeaux is a top travel destination now. Want to go? 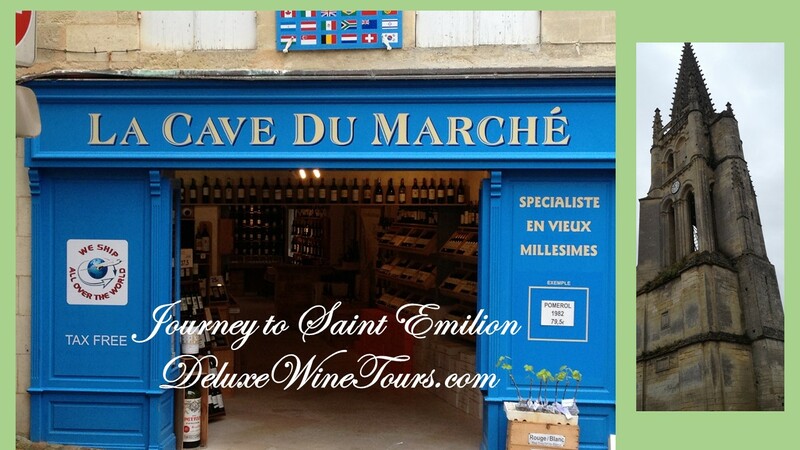 You can join us on an amazing small group tour, not only of Bordeaux, but Paris and Champagne, too! March 15 to 22, 2016. 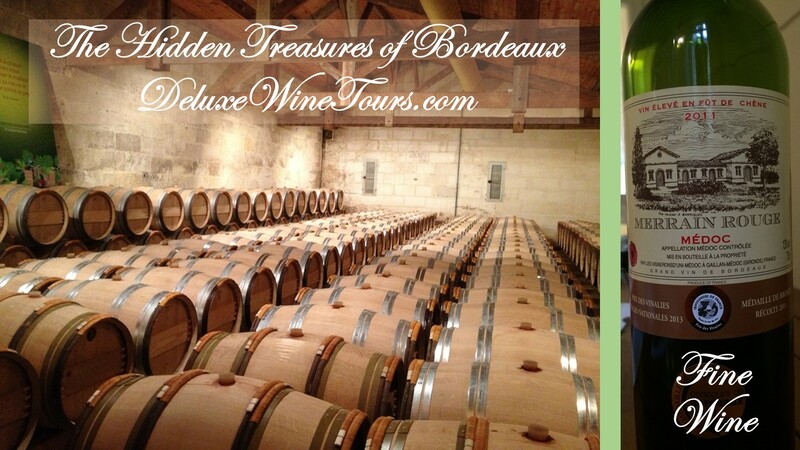 Go to Deluxe Wine Tours (LINK) for all the information! 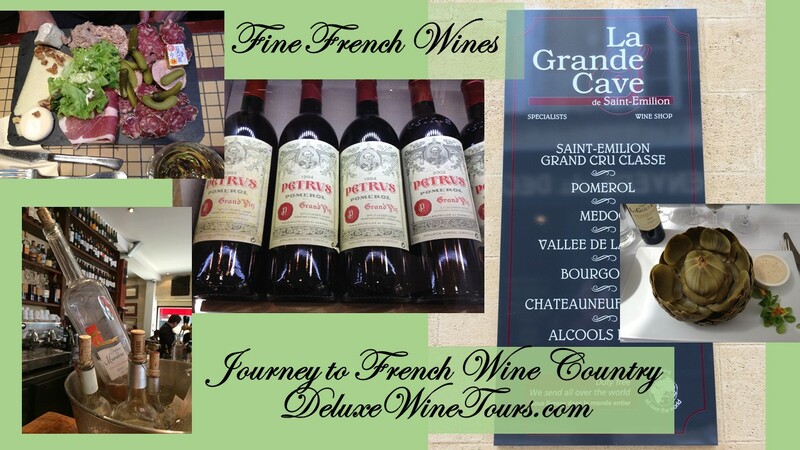 I am very pleased of officially announce the launch of DELUXEWINETOURS.COM (LINK), my new venture with Journey Different, Inc. to provide unique wine tours in France. Our focus is on bringing wine lovers into contact with wine makers and others in the industry in the great wine regions of France. 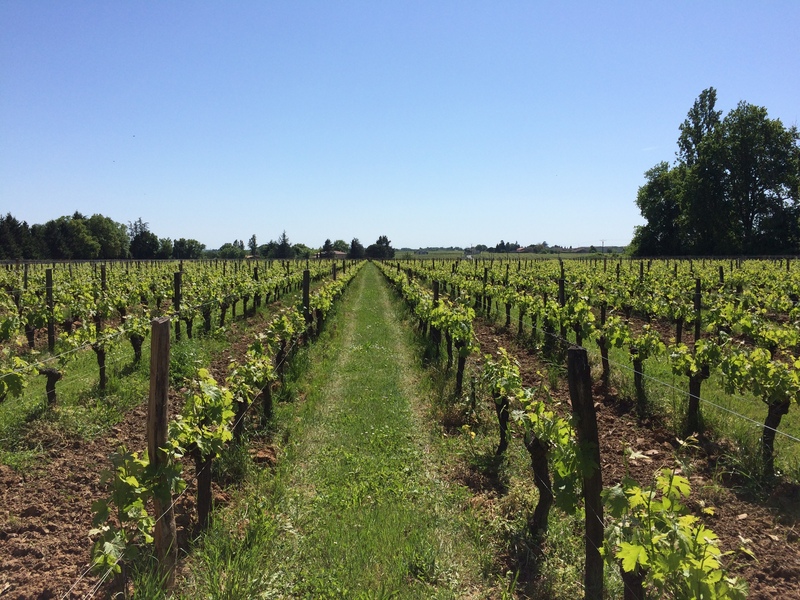 Chateau Guibeau and its Organic Vineyards in St. Emilion are on our Itinerary! Why France? Because France is the modern-day cradle of all things wine. 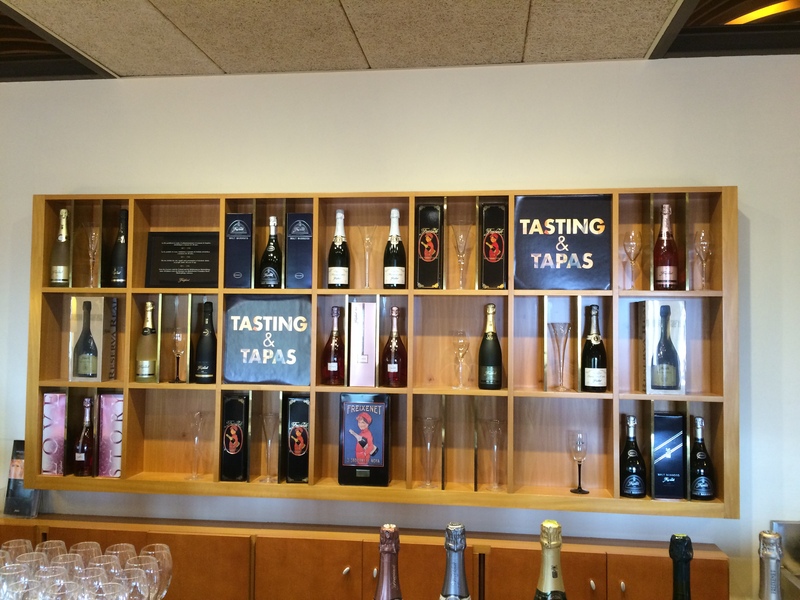 Wine may not have originated there, but modern wine culture is centered there. And, it is a truly beautiful country, offering great cities such as Paris and Lyon that can be added to itineraries and provide a much richer experience. You are invited to join us for this unique and exciting inaugural tour! 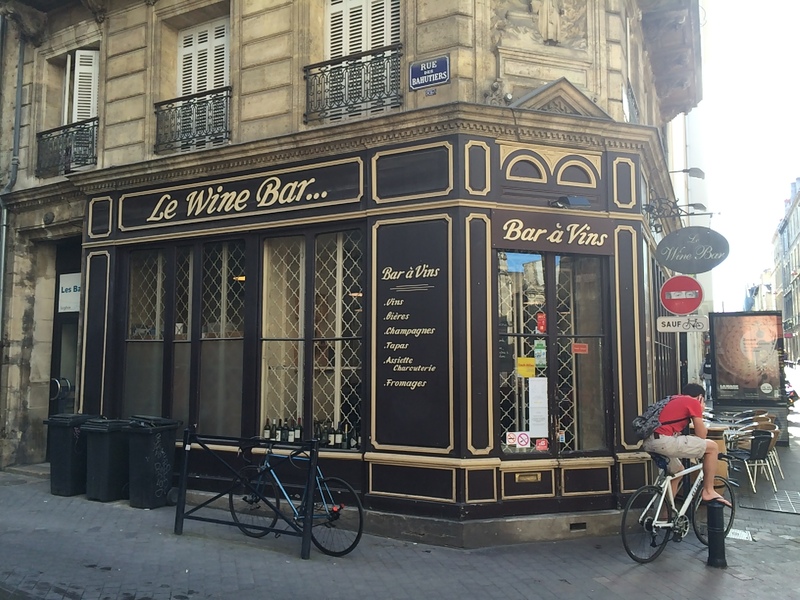 Le Wine Bar, the top-rated wine bar in Bordeaux is on our itinerary! 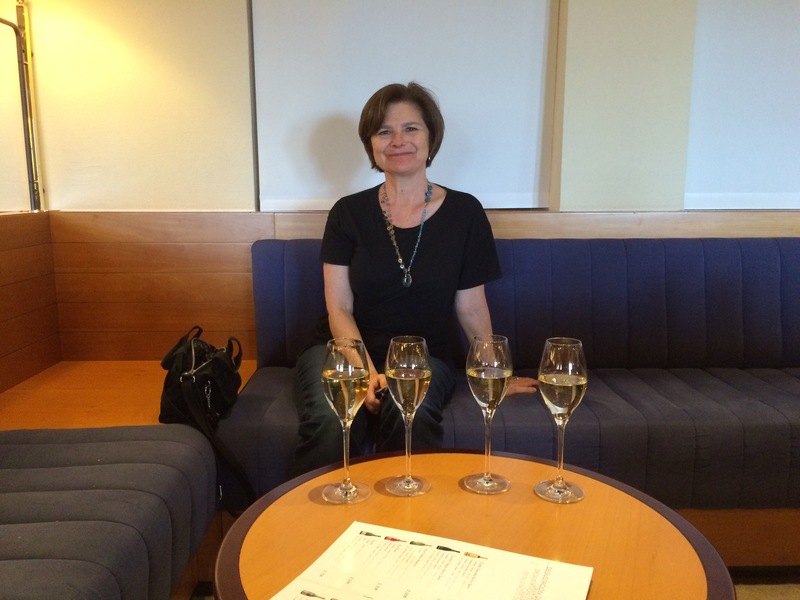 Our first small group tour, scheduled for March 15-22, 2016, is to include Bordeaux, Paris, and Champagne. 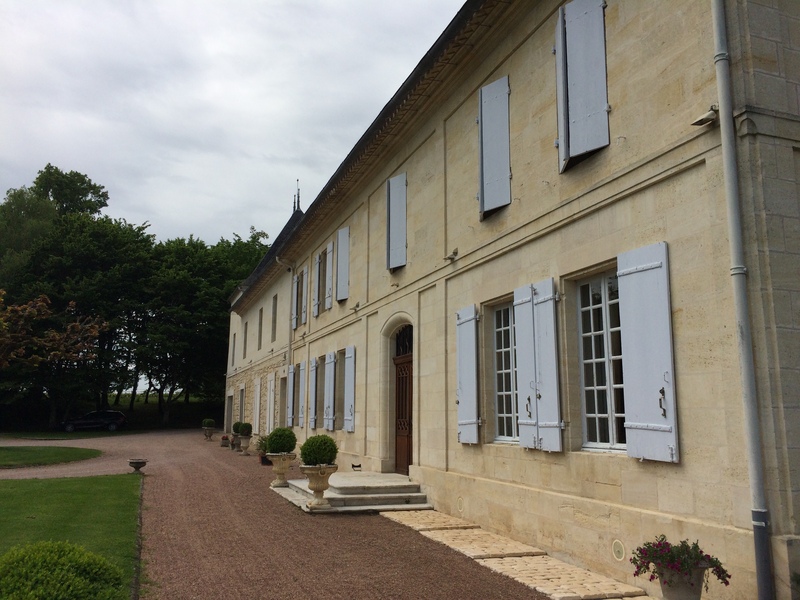 We will combine visits to châteaus with great meals (some of them IN the châteaus) and fine wine tastings, wine seminars, luxury accommodations, local guides and experts, time in the vineyards, opportunities to purchase fine wines to ship home, a literary walking tour, TGV train travel, and more! Did I mention that there would be great food? Visit our website (LINK) for all of the information and to register at a limited time discounted price. Tell your wine-loving friends about this great opportunity to experience the best of French wine culture with me! 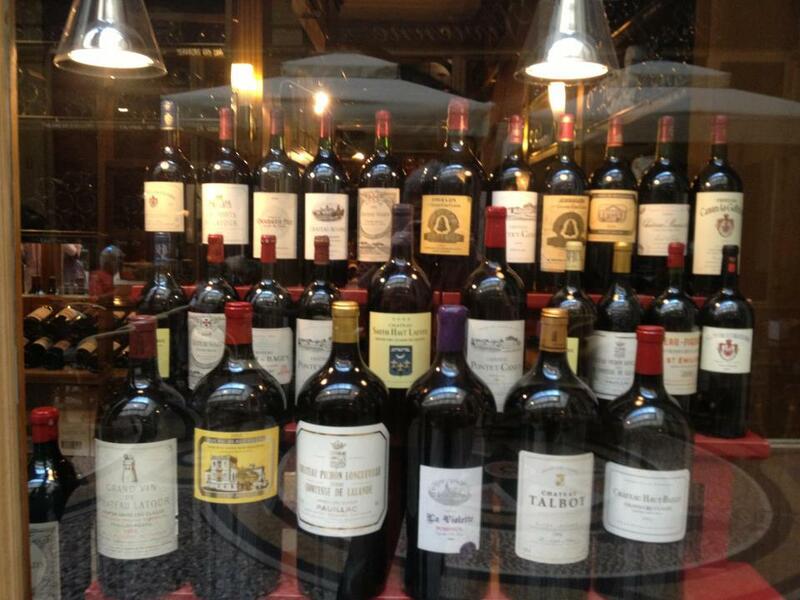 Large Format Bottles in a Paris Wine Shop Window. 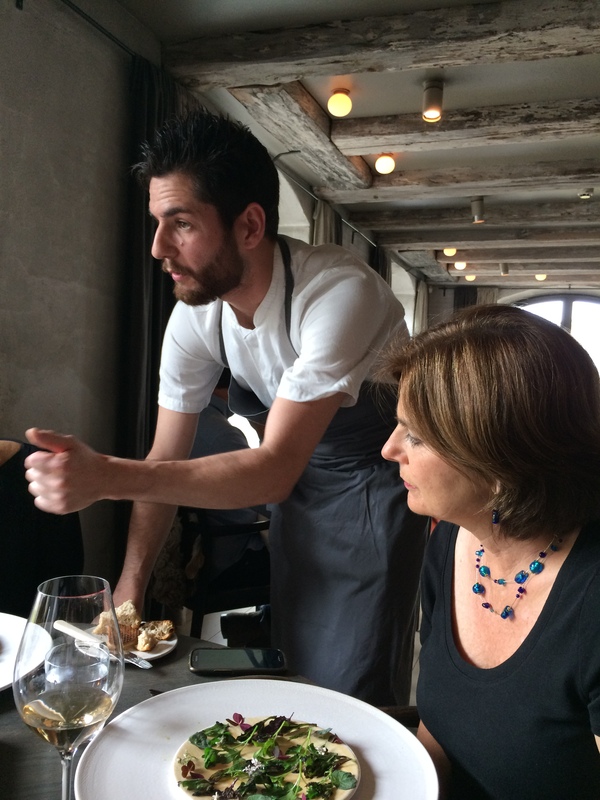 The food at Noma changes, sometimes daily. It is based on the seasons, on what has been foraged that morning, on what the chefs are trying to do, and, I am sure, on other factors that I know nothing about. Everything that we had was unique and clearly well thought out. I did not like everything, but I did not hate anything served. There was quite a bit of “sour” taste on the menu, and some on the wine list. There were some dishes that were interesting but not memorable. And there were some that soared. Those experiences were different for each of us at our table for four – Dorianne, me, and friends Ginger and Patricia. Three of us opted for the wine paring, Ginger opted for the juice pairing – a different juice blend comes at the same time that new wines are introduced. She raved about the juices, and we all tasted some and they were very, very good. The presentations were unique, generally attractive and appealing, and mostly, delicious. There were lots of flowers, some rocks, mushrooms, moss, leaves, dough, lobster, bone marrow, berries, and many things that I had never seen on a plate before. 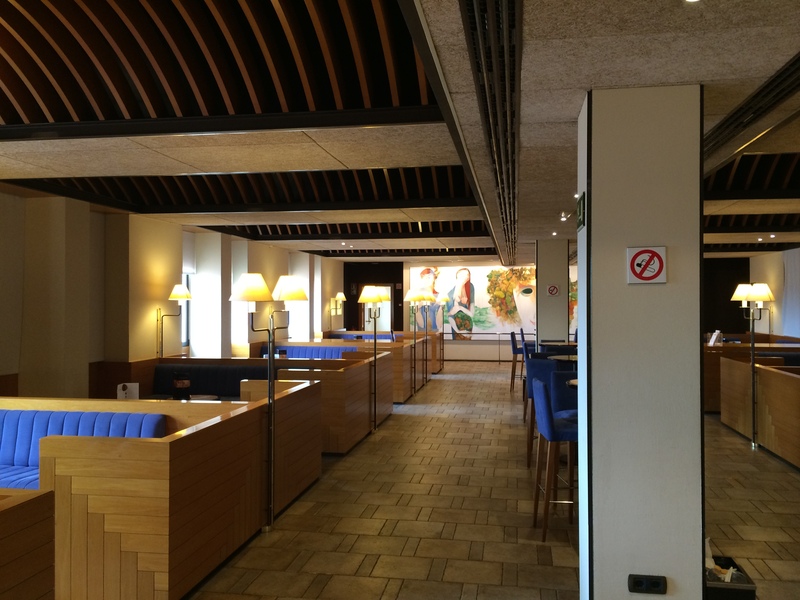 The restaurant is very nicely appointed, but not flashy at all. 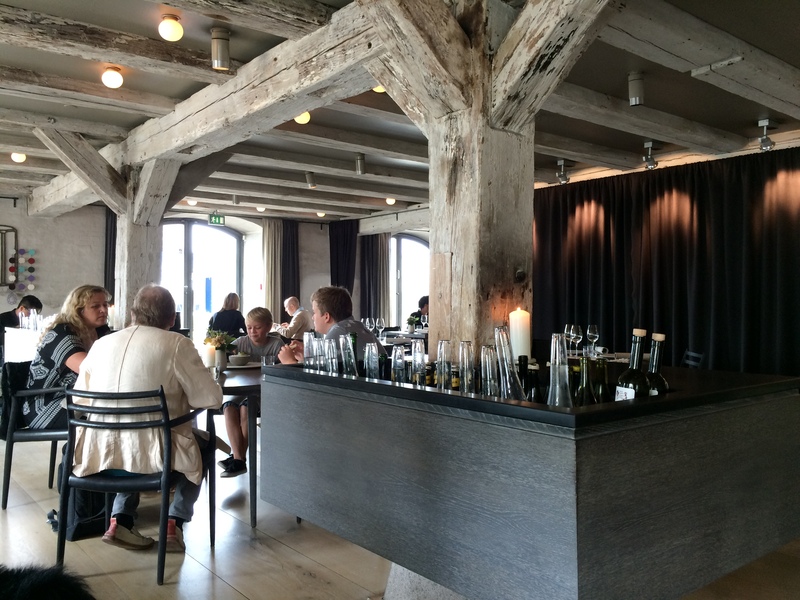 Rough-hewn wood, lots of gray colored fabrics and surfaces; you might say that the dining room is understated, as you might expect in Denmark. The Dining Room with the Wine and Juice Cooler. The tables are simply set. There is a clear effort to have guests feel welcome and to make the experience as unpretentious as possible. Staff are friendly, direct, and relatively informal. They do what they do very well, are always in motion, but have time for any query or request. Turnip and Unripe Strawberry Marinated in Aquavit with chamomile and other berries. Served on Ice. 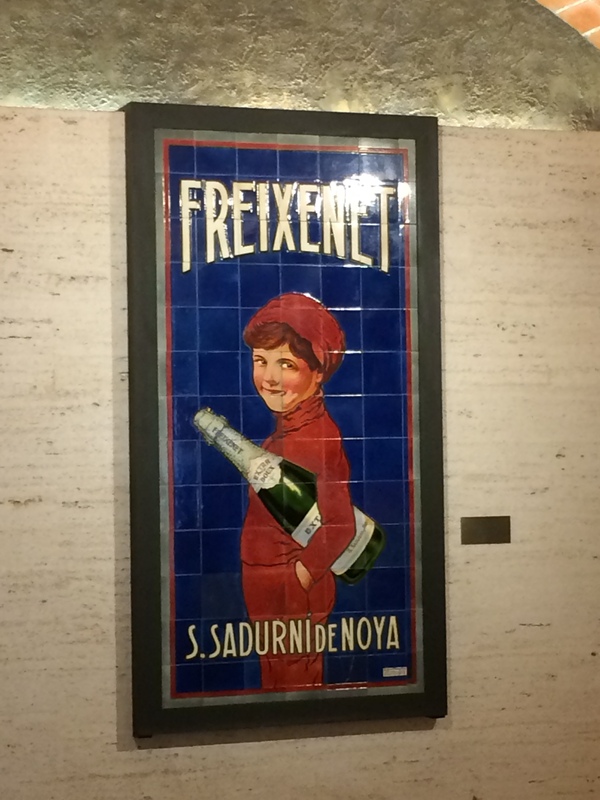 The First Wine – Not on the Menu – A Champagne. The first three courses are not considered a part of the pairing dinner. 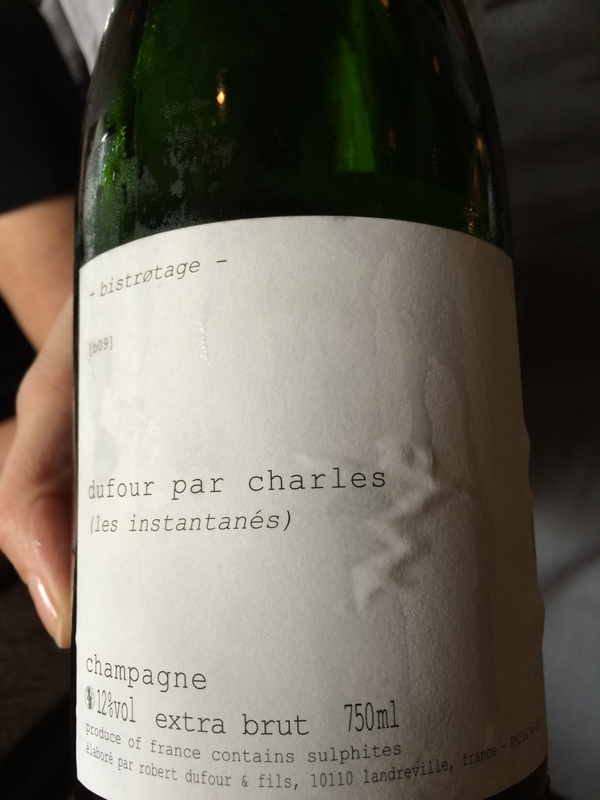 We were served a Champagne for all of these courses, a dufour par charles champagne “les instantanes”, which I could not find in an internet search (found the producer, but not this wine). 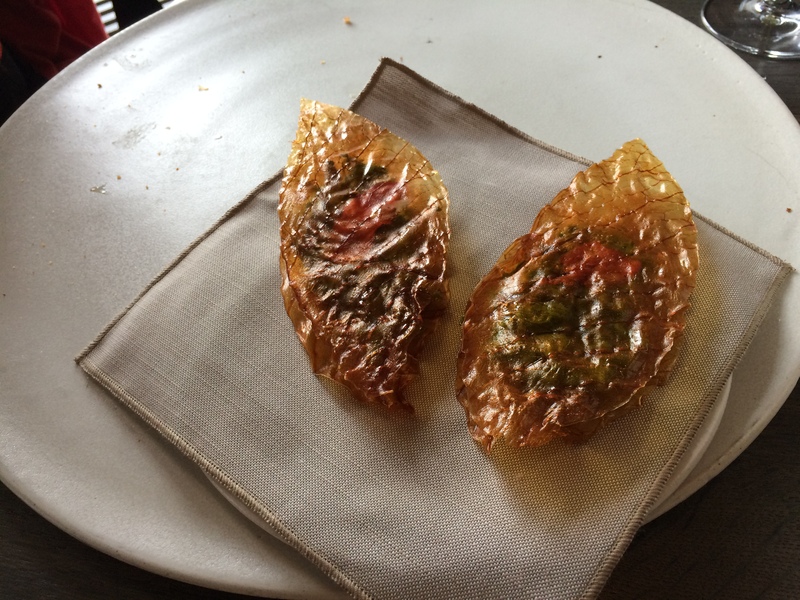 Suffice to say that it was very well made, light and crisp, and you likely will only get it at Noma. 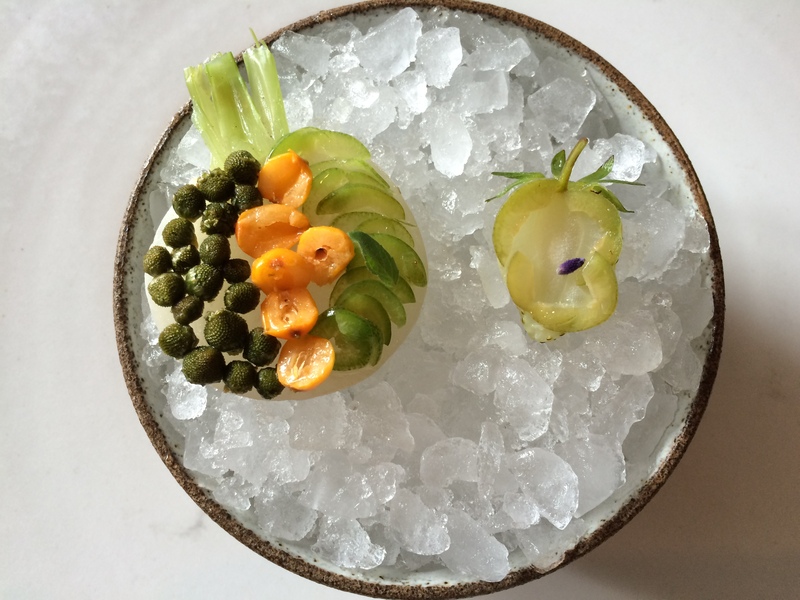 The first item served to us was a small bowl of ice topped with turnip and unripe strawberry marinated in Aquavit. 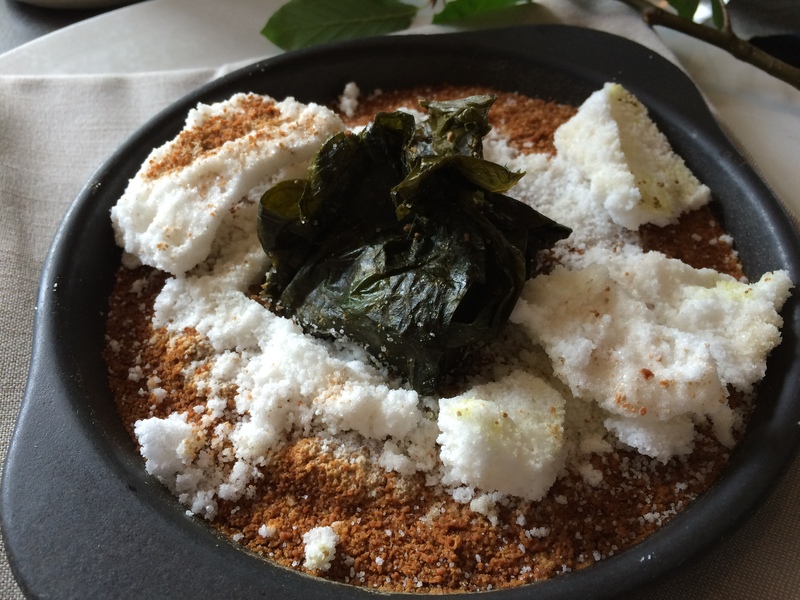 There are obviously other things sitting on top of the slice of turnip and the strawberry, berries, flowers and such – there are always other things on the dishes that are not described on the menu, but are described by the server. The server, by the way, will be either one of the wait staff or someone from the kitchen who worked on the dish being served. This dish, eaten with the fingers, was very tart (Aquavit and unripe things) and the Champagne was a wonderful match, giving a sense of ripeness, but not too much. I was thinking that they know what they are doing. Smiles, oohs and aahs, and photo taking all around the table (I stopped the server to photograph each wine bottle as it was served – they were wonderfully patient). A very good start. 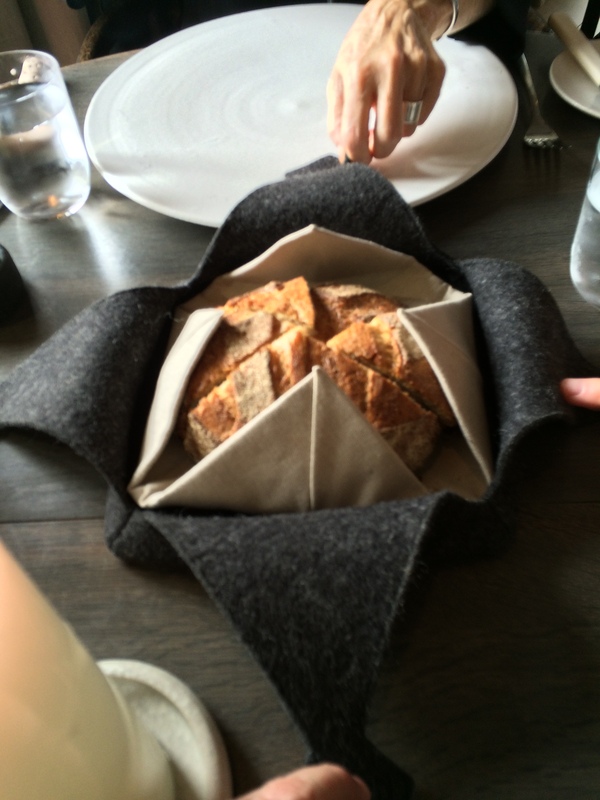 The bread, served in a felt basket, made from native Oland wheat and accompanied by both butter and rapeseed oil was delicious. The basket was refilled at least twice during the meal. Summer Cabbage Leaves and White Currants. The sauce being added to the Summer Cabbage for Patricia. 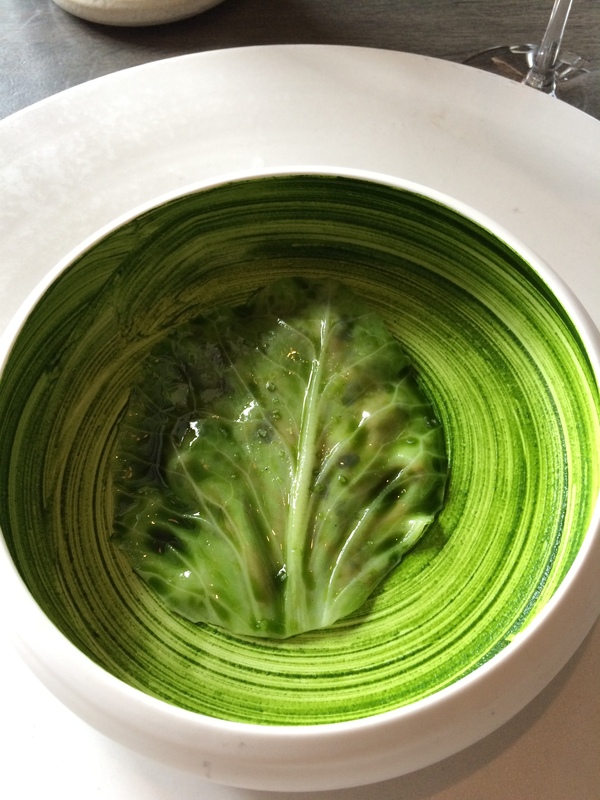 Next came summer cabbage with white currants and a white currant broth that was added at the table. This continued the tendency toward sour, unripened flavors. It could be classified as a soup, I suppose. Again, the Champagne was right there to extend and ripen the experience of the food. The First Shoots of the Season with Scallop Marinade. 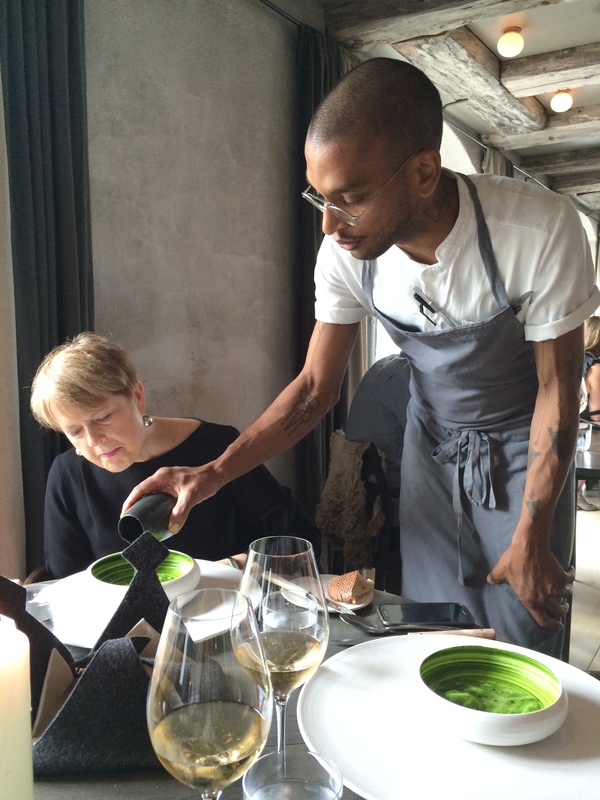 Dorianne Looks On as the Dish is Explained. Next, course #3, the first shoots of the season with a scallop marinade, again with the Champagne. The plants were tiny and tender, some of them toasted, and after enjoying the presentation, you mix them all together in the thin layer of marinade and eat them in a few bites with your fingers. The rush of various flavors and the marinade tasting of the sea was delicious. After doing yeoman’s duty, it was time to part with the Champagne. Note: they do refill your glasses as often as you like. Now, the actual wine pairing begins! With Sake! 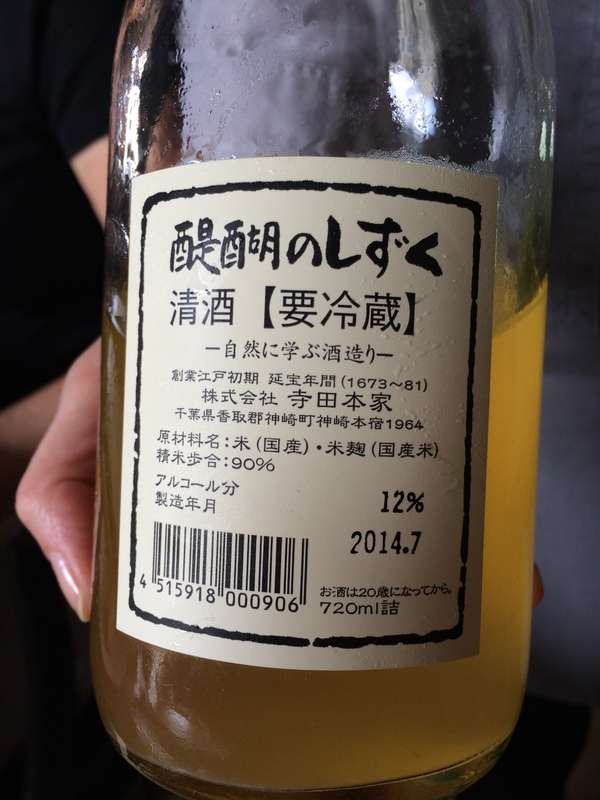 A 2014 Daigo No Shizuku Terada Honke (LINK), to be exact, which would take us through the next three courses. Full-bodied with a soft and approachable taste; hints of citrus and a long finish. Sweet Peas and Sliced Kelp. 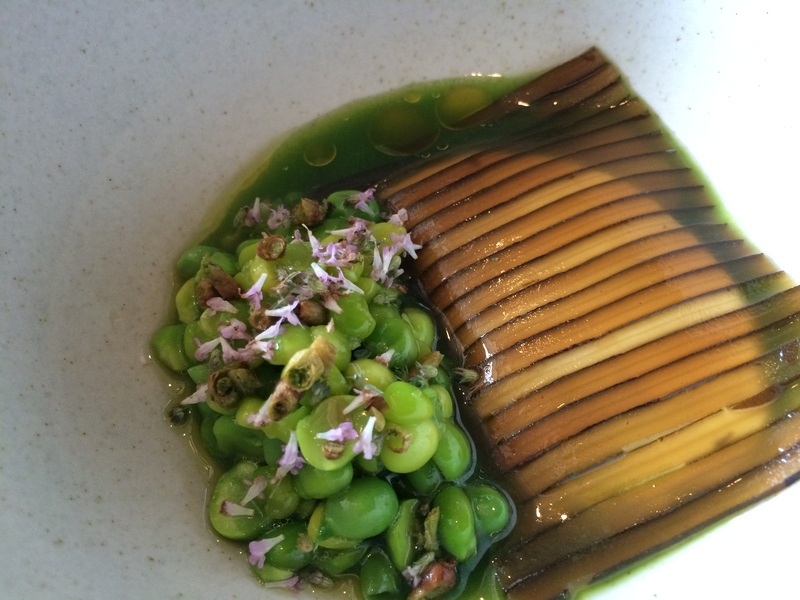 Sweet Peas and Sliced Kelp – Close Up. 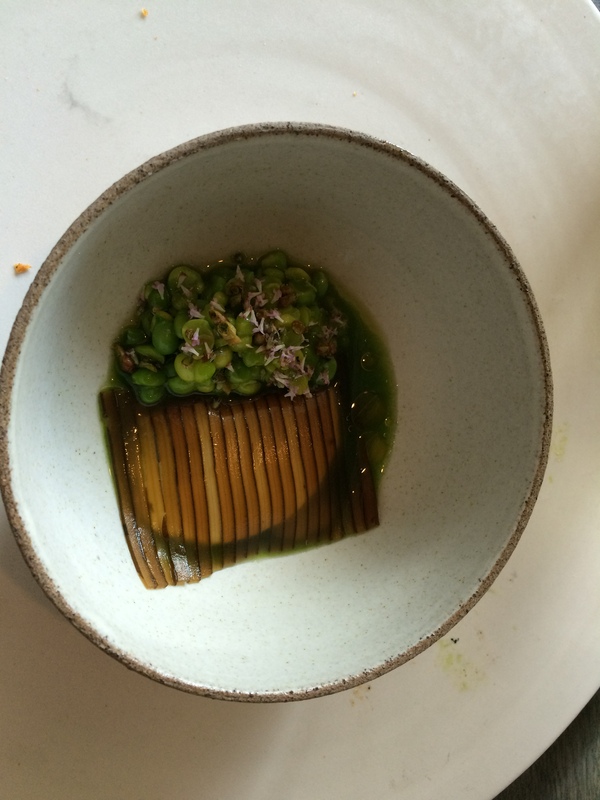 The first course of the pairing was sweet peas with sliced kelp. 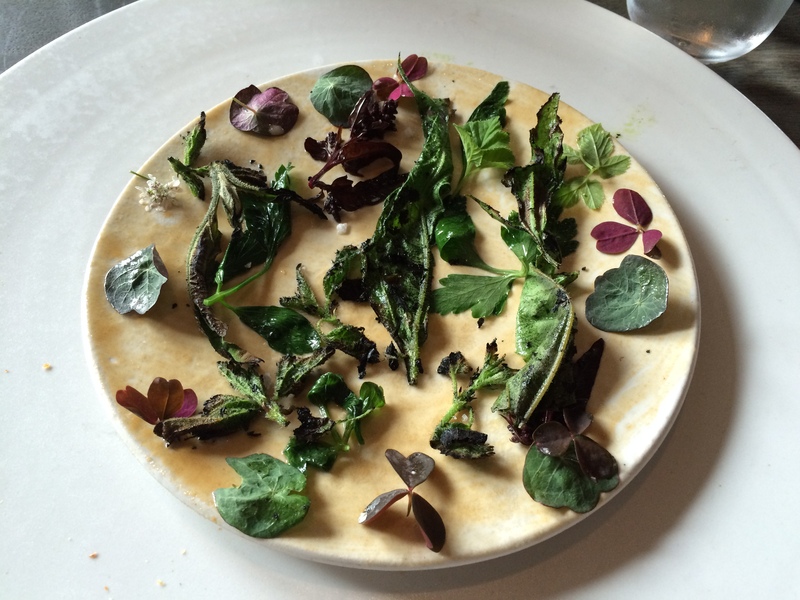 There was a cheese under the kelp – like a ricotta but not a ricotta; and nasturtiums in with the peas (we will see more nasturtiums), all in a sauce. Very tasty with a mixture of textures and flavors. The sake went well with this. One of the most picturesque dishes, the flower tart. 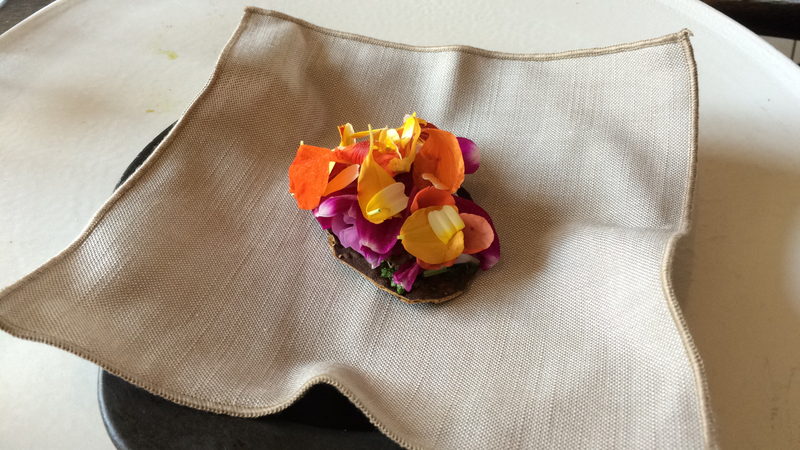 Various petals over a vegetable spread and placed on something like a cracker. We ate it like a small slice of pizza. 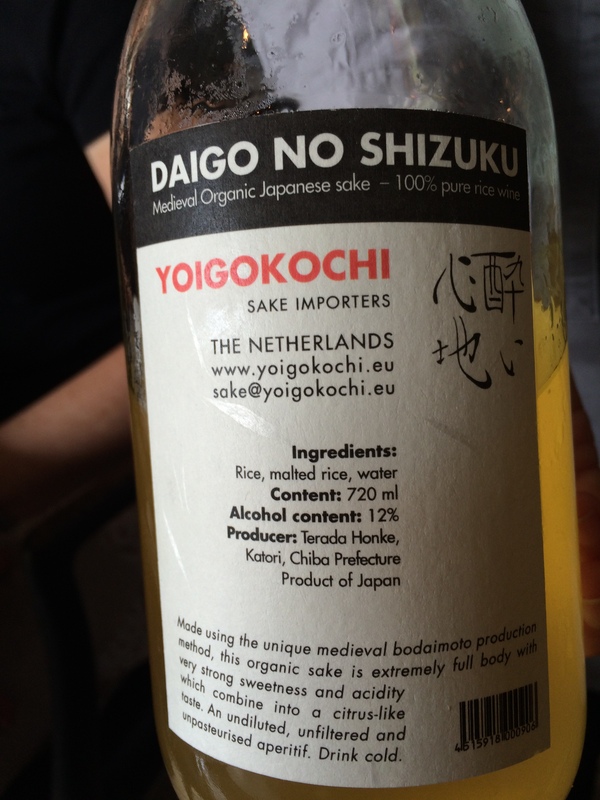 The sake was less successful here, as it was far more tart than the “tart,” so to speak. This experience reminded me of my childhood, sampling most of the flora in the neighborhood. This dish prompted a nice discussion of all of the things that we ate as children that were not from the home larder. A delicious and fun dish. New Danish Potato and Lavage. New Danish Potato and Lavage – Opened. 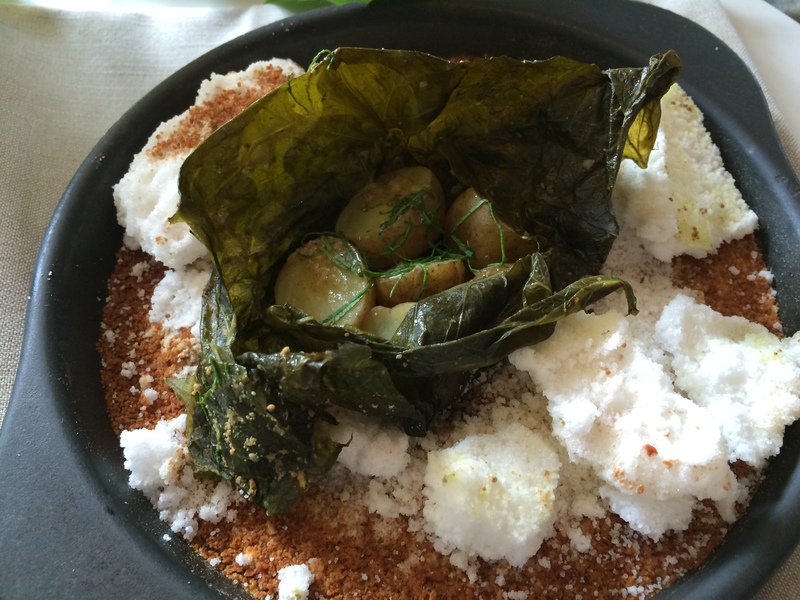 Next came new Danish potatoes wrapped in a lavage leaf, residing on a bed of two kinds of salt (it was recommended that we not eat the salt). This dish was intriguing. The potatoes, once revealed by opening the leaf, were to be eaten with a sharpened Elm twig (very Paleo). They were warm, soft, and, when touched to the salt, delicious! The leaf was also edible, but had absorbed too much salt to be enjoyable. The sake added a fullness to the experience and was a good pairing for this dish, and it completed its duty with this serving. Sweet Shrimps Wrapped in Nasturtium Leaves. 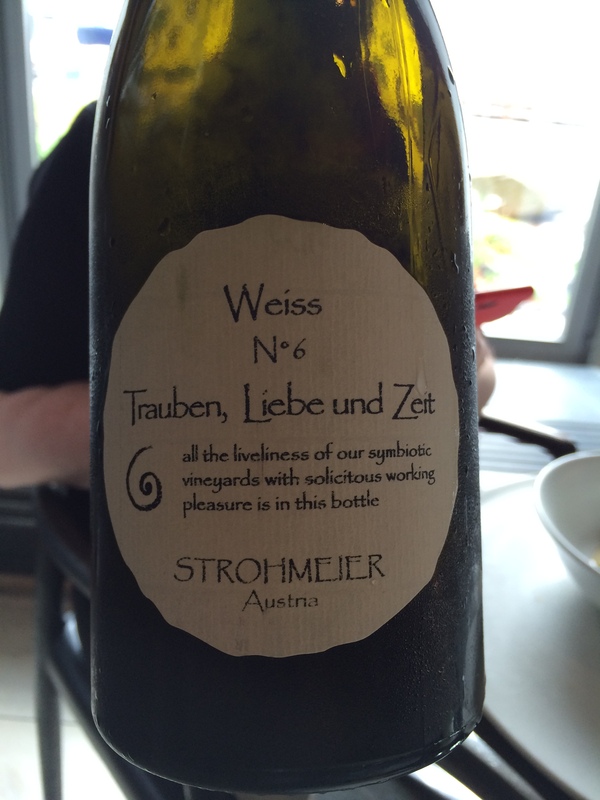 2013 Strohmeier Weiss #6 – Tromen Liebe and Zeit, 50/50 Chardonnay and Pinot Blanc. Austria. 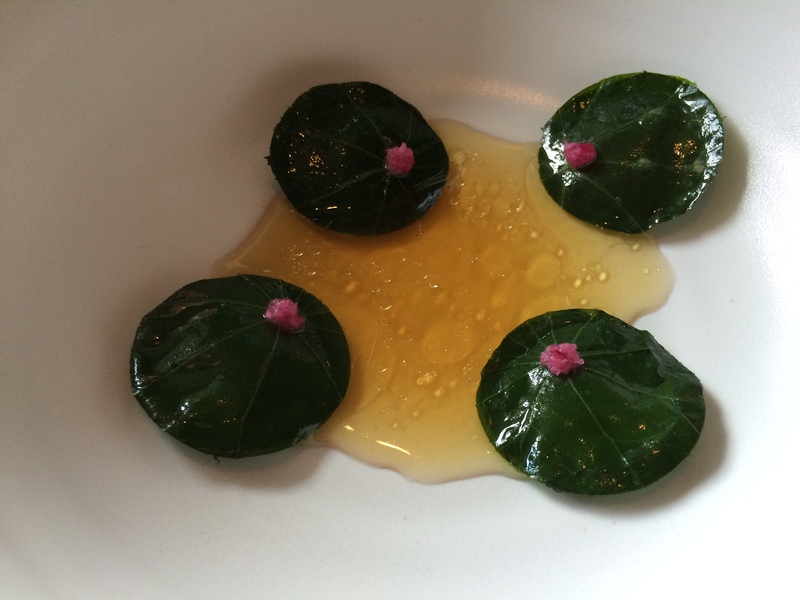 The next course was sweet shrimps wrapped in nasturtium leaves with a seafood broth. Very tasty – the shrimp and the leaves were a good mix of textures and flavor. 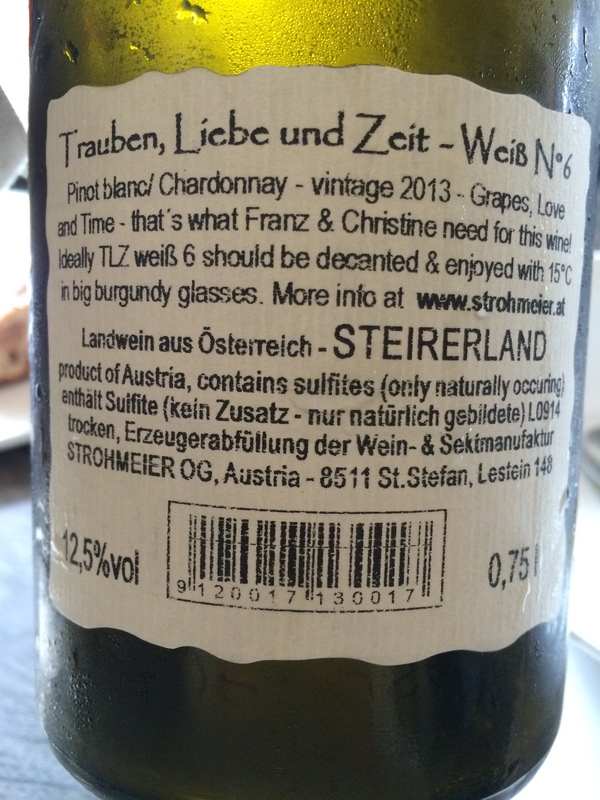 The next wine was 2013 Strohmeier Weiss #6 – Tromen Liebe and Zeit, 50/50 Chardonnay and Pinot Blanc from Austria (LINK). This is really a nice white wine. I have loved the whites (weiss) of Austria since visiting there in 2009. I am a particular fan of Grüner Veltliner, the wonderful white grape so popular there and now being grown in California. But I digress – the Strohmeier has the nice acidity that one expects from Austrian whites, plus, the Chardonnay gives it a fuller mouth feel. It was a great accompaniment to the shrimps in nasturtium. Of course, this could be my appreciation for a more familiar wine after the sake. 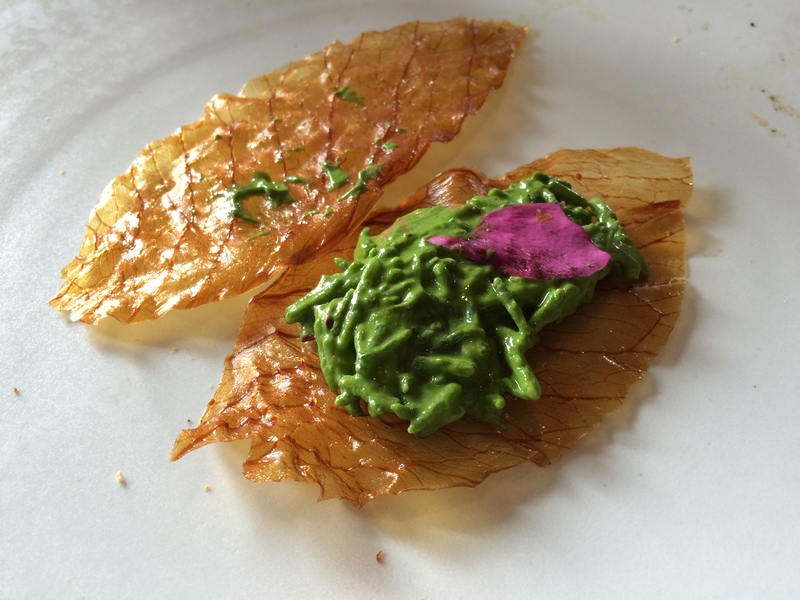 Next came cabbage and roses; dried and candied cabbage leafs sandwiched around samphire (sea asparagus) and rose petals. The leaves were crunchy and the middle was soft and creamy. Eaten with your hands. The 2013 Strohmeier Weiss #6 accompanied this dish very well, giving a smoothness to the experience. So that is the first half of the Noma dinner, nine courses with nine more to go; and five more wines (by the way, no red wines)! Those will be depicted and described in the next installment, Part 3.